I’ve been making my own sodas for a while now. I started off cheating, which, by the way, I hear is all the rage right now. It seems like a lot of people are buying those SodaStreams and mixing the soda water they make with different flavorings. I have nothing against that, in fact, I’m planning to one day get my own CO2 tank and rig up my own version of a SodaStream so I can make seltzer. But ever since I perfected my real ginger ale recipe, I’ve been hooked on really making soda. In addition to ginger ale, I liked making root beer and birch beer, but I was daunted by the prospect of looking for roots and for a long time stuck to using extracts. The sodas I made from the extracts tasted fine, but I knew that couldn’t go on forever. I’m just not an extract kinda gal. So I bought Homemade Root Beer, Soda & Pop by Stephen Cresswell. Now, I really like this book and it has a lot of great recipes I’m looking forward to trying, but nearly all of the root (and birch) beer recipes call for, well, roots. And while I’m not an extract kinda gal, I’m also not the gal who knows where to go to find these roots, how to identify them, and how to dig them up unobstrusively, and the book doesn’t go into that. One day I fully intend to make root beer from roots I have dug up, and birch beer from birch trees I have accosted (the latter seems easier, frankly), but in the meantime, I turned to my friend the internet and ordered myself some roots. The main root you need is sassafras. I bought it from Amazon, but that is way, way, way more sassafras than you need. Later I found it in smaller quantities at American Spice Company and Mountain Rose Herbs, the latter from whom I have ordered before (get the bark, not the bark powder). Sassafras is slightly hard to find, I think because the FDA thinks it’s a carcinogen or something. Don’t be alarmed: a glass of root beer every now and then is not going to give you cancer. Maybe don’t drink a gallon of it a day, but then again, don’t drink a gallon of anything a day, other than water. You need champagne yeast. Stephen Creswell of Homemade Root Beer, Soda & Pop prefers ale yeast, but I haven’t tried that yet. Technically you can even use bread yeast, but I absolutely do NOT recommend it. I tried it ONCE the first time I made soda and it was nasty, nasty, nasty. I’m sure I did something wrong, but I’ll always use a beer or champagne yeast from now on. It’s sold in packets just like bread yeast, and you won’t need a whole packet. Just store the unused portion in the refrigerator and it will be good for a while. Finally, you need bottles. The recipe makes about a gallon, which is 8 16-oz bottles. I strongly recommend you use swing-top (aka EZ cap or Grolsch-type) bottles. You can drink Golsch and save the bottles, or buy them. Jay’s has them. They actually hold more than 16 oz, so I always end up filling fewer bottles than I expect to. You can also buy or save non-twist-off-cap bottles and buy caps and a capper, but the reason I strongly recommend the EZ caps is I have found root beer in particular to be unpredictable in the amount of time it requires for carbonation and I like to be able to close bottles that aren’t ready yet and reseal them. I also don’t always drink 16 oz+ of soda at a time and like to be able to reseal them for that reason too. This recipe was lightly adapted from Homemade Root Beer, Soda & Pop, and I’ve more or less used his technique. The author calls for mixing the sodas in a one-gallon glass carboy. I have three of these: I have two from beer brewing kits, and one that is from a gallon of apple cider. They are the exact same thing; I can’t tell them apart. Jay’s sells them too, but I paid less for the apple cider than they charge, so if you want a jug, just buy some cider. You don’t need a jug though. The jug makes it easy to shake the soda really well, but before I had jugs, I just whisked everything together in a pot. OK, FINALLY, here’s the recipe! This is my measured sassafras and sarsaparilla. Put the dried roots, sugar, and two quarts of water in a pot and bring to a boil. Reduce heat and simmer for 25 minutes. Then remove from the heat and let sit, covered, for another 25 minutes. Strain the liquid. This is only half of it – I wanted to decant it into a clear container so you could see the color. You might be able to make a second batch from the roots – I haven’t tried that. If you have a gallon jug, pour the liquid into the jug through a funnel. If you don’t have a jug, skip this step and just put the liquid in a 6-quart pot. Add two more quarts of cold water, cap jug, and shake. (Or whisk well in a pot.) You want to cool the overall temperature of the soda to 70 to 76 degrees Fahrenheit. You can do this by just letting it come down to room temperature naturally (if you are patient), by putting it in the refrigerator, or by setting it in an ice bath. Whatever floats your jug. Just make sure it cools down to room temperature (you don’t even really need a thermometer) so you don’t kill the yeast when you add it. Add the yeast to 1/4 cup lukewarm water (about room temperature) and whisk. Let sit for a couple of minutes. Add the yeast to the soda, cap the jug, and shake vigorously for a minute or two (or add to pot and whisk very well). Use a funnel to pour the soda into the bottles and close or cap the bottles. Leave about 1″ head space at the top of the bottles. Put the bottles in a cool, dark place – not a refrigerator, but maybe a basement. I’m not going to lie to you: explosions are possible and I’ve had root beer explode, so what I do is put the bottles in my laundry room and cover them up with a giant trash bag so I can contain the mess if disaster strikes. I haven’t had one explode since I’ve been doing that, so I think maybe it subdues them into submission. After 48 hours (maybe sooner if it’s really hot in your house), check the carbonation by opening one of the bottles. You can generally tell by how fizzy it seems when you open it, but you’ll also want to take a sip to judge it. If it’s as fizzy as you want it, move the bottles to the refrigerator. If it’s not, keep testing it every 12 to 24 hours. Every recipe I’ve ever read has made it seem as if it’s usually ready right around 48 hours, but I’ve had some sodas that have taken up to a week to be fully carbonated. If it takes that long, I usually put it in the refrigerator anyway and let it finish carbonating slowly. Refrigerate the bottles for at least 24 hours. I’ve found that sodas really taste best after about a week of refrigeration, but bear in mind, although refrigeration greatly slows down the fermentation, it does not stop it, and your sodas will build up more and more carbonation if you leave them in the fridge. If you aren’t drinking them fast enough, open them periodically to release the pressure…although I wouldn’t keep doing that or you’ll have the reverse problem and they’ll go flat. You’d be wise to open your bottles over the sink regardless how long you’ve had them. I don’t know what it is about root beer, but some bottles in the same batch just seem to have different levels of carbonation, so I don’t trust any of them to not geyser all over me. After it’s chilled for at least 24 hours, it’s time to drink! This is a little 8-oz bottle I saved from some commercial soda that I bought just for the bottles. I had a hard time choking down that soda, I’ll have you know. But I like to make a few small bottles to use when checking the carbonation, and also 8 ounces is about how much soda I really want to drink at a time. Pour into an icy mug and enjoy! Root beers and other sodas were originally created as health tonics. I’m not going to tell you that something with this much sugar is a health drink. I don’t drink that much of even my homemade soda, although it’s far less sweet than commercial soda (and the yeast consumes a lot of the sugar; it’s not as sugary as it sounds). But there is something about this homemade root beer that makes me consider it a restorative. I like to drink a bottle after a long, hard morning of working with raccoons. I come home exhausted and make a quick meal that I serve with my homemade root beer and suddenly I feel refreshed. And I came home tonight with a headache but a glass of root beer has given me the strength to go put together this baker’s rack that arrived today…which I’d better get working on! This post is dedicated to my paternal grandfather, who I remember making root beer in his basement when I was a kid. He died years ago and unfortunately my father doesn’t know how he made his root beer. I wouldn’t be surprised if he used an extract, as I don’t recall him tramping around the woods collecting roots, but making root beer reminds me of him and I think that’s nice. Wish you were here to share a mug, Granddaddy! No, the title of this post does not refer to me and Mark. Nor Gomez and Torticia. No, in fact I made two dips for dinner tonight: baba ganoush and smoky herbed bean. Why? Who knows. Tonight’s dinner was all over the place. I had some eggplants from the farmers market I needed to use. I also wanted to clear out some of my dried beans because I’m expecting a shipment from Rancho Gordo next week. There were frozen falafel in the freezer. Frozen naan. More vegetables from the farmers market. I even made Mark some barbecued seitan. Somehow it all seemed to work together, though. Preheat the oven or toaster oven to 400 degrees Fahrenheit. Prick the eggplants all over with a fork. Roast eggplant for about an hour, or until very soft, turning every 15 minutes or so. They will have caved in on themselves. Mince or press the garlic. This is waaaay more than you need; I was making several dishes requiring garlic at the same time. When the eggplant is done, let cool until it can be handled, then peel it and put it in a food processor or blender with the rest of the ingredients. Makes about a cup, maybe a little more. Cook beans until very soft – I used my pressure cooker. Drain beans and place in a food processor or blender with the rest of the ingredients. Process until smooth. Garnish with vegan “bacon” bits, and/or drizzle with additional olive oil, if desired. Here’s everything, minus Mark’s bonus barbecued seitan. I also made yellow wax beans. In retrospect, those falafel don’t make for a very appetizing photograph. It’s hard to follow cat party, but if you don’t need the next four minutes of your life, you can watch Gomez get high, and Torticia not get high, on the ‘nip. I want to keep you posted on Rica and Rowena Raccoon, but it is very, very, very hard to take a picture of active raccoon kits, especially with an iphone. This is the best I could do. They are waiting to be fed. Next time I’ll wait until after I feed them and they are at least a little quieter! Cucumbers were $1 each or 3 for $2 at the farmers market yesterday, so I got three. But considering I already had half of one at home, that was far more than I needed for tossed salads this week, so I made a cucumber salad. Instead of my regular cucumber salad, however, I made a Korean cucumber salad. When I didn’t know what to make for dinner tonight, I decided to make something that went with the Korean cucumber salad. So basically this dish has nothing to do with cucumbers but happened because I had excess of cucumbers. It’s a “generic” Korean dinner because you can use whatever protein and vegetables you have on hand. Chop the ginger and smash the garlic. Combine the gojujang, ginger, garlic, brown sugar, vinegar, and sesame oil in a food processor or blender and blend until smooth. Thin with water if necessary. Stir fry the vegetables and proteins in a wok over high heat, adding them in order of descending necessary cooking times. Reduce the heat a bit and add the sauce, stirring to coat everything. Cook for a minute or so. Top with scallions and serve with sushi rice. After a brief mingling session, Mark announced it was time for prizes and began his awards ceremony. Gomez took first place in the category of Perfection. Torticia took home the Outstanding award in the category of “Being Cuddly and Awesome”. … Torticia decided she found cat party terrifying and fled. … and eating so much party mix I was worried he was going to spoil his appetite for dinner and/or get sick. … until Mark accidentally touched a balloon and she was off again. Gomez, on the other hand, didn’t even care about the noise makers – as long as I used it silently. All in all, three of us had a grand time at the cat party. First, get the beans cooking. A pressure cooker is s huge help here. Place all ingredients in the pot, with the broth just covering the beans. I cooked them for six minutes in the pressure cooker, then quick-released the pressure, returned to the heat and cooked another 15 minutes or so, boiling off some of the liquid. Careful with those pressure cookers: usually I don’t care if I overcook pintos because I like them refried anyway, but for a salad you’ll want to retain a bit of a bite in the bean. If you don’t have a pressure cooker, cook until tender but still a bit firm. When the beans are cooked, drain them if necessary, reserving any liquid. I had about 3/4 cup liquid. Make the dressing by whisking all of the ingredients together. Set aside for flavors to blend. Cut the corn from the cobs and boil in water to cover for 10 minutes or until corn is tender. Drain, again reserving the cooking liquid. To make the couscous, combine the bean cooking liquid, corn cooking liquid, and, if necessary, enough water to make 1 1/4 cups of liquid. I love it when I think to use cooking liquids for other purposes. If you aren’t using dried beans and/or fresh corn, you can use broth or water to make the couscous. Heat the liquid to boiling and pour over the couscous. Cover and let sit for 5 minutes, then fluff with a fork. Prepare the salad: chop the tomato, avocado, and onion. Gently toss the vegetables with the beans, corn, and dressing. I use my hands. Line each serving dish with lettuce leaves. Put some couscous on the lettuce, then top with the bean and veggie mixture. If you have it, sprinkle with just a touch of smoked salt flakes. Garnish with lime wedges, to be squeezed over the salad, and serve a hot sauce like Tabasco on the side. Mark seemed quite impressed with the presentation of this meal. I told him it just looked nice because of the lettuce leaves, but he said it went beyond that and looked very “fancy”. I don’t know that it really looked all that fancy, but when I later asked him if he liked the way it tasted he said it tasted “like summer” and was (I was to quote him) “summertastic”. I don’t know if it’s just one of those married people things where we can read each others’ minds (it happens), or if I’m just good at making meals that say exactly what I want them to say, but “like summer” was exactly what I was going for. He also requested the leftovers for lunch tomorrow, so I know he liked it. I only had one avocado, but I think the one thing that would have improved this salad would have been a second one. I probably really should have made 1 1/2 to 2 times as much couscous for this amount of salad as well. And here is a very cool, very old tree. Now for a raccoon update. 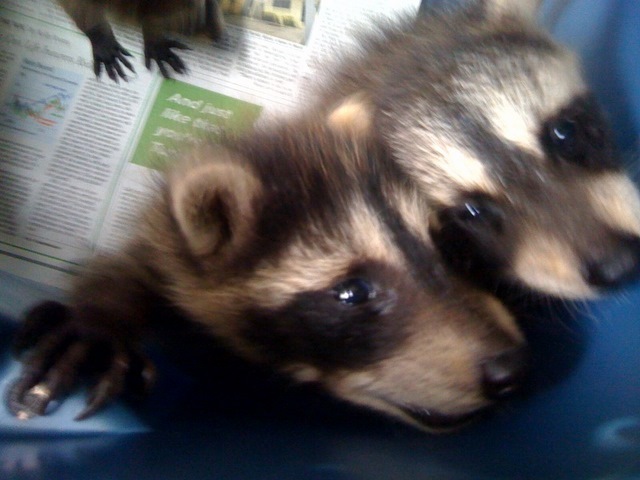 The bad news: Rachel Raccoon never collected two of the three babies. 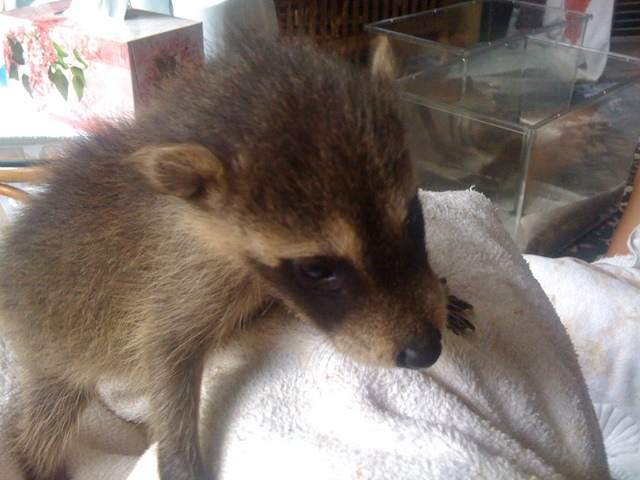 The good news: because I volunteer with a local wildlife organization and had been in touch with a raccoon rehabilitator about working with her even before the raccoon/attic incident, I got a crash course in feeding very hungry, very vocal baby raccoons, and then drove them to the rehabilitator myself. And Sunday I started helping the rehabilitator on what will be a regular basis, so I got to visit my babies again, and I’m going to help raise and eventually release them! They’ve been named Rica and Rowena – they are both little girls – and I’m not sure which one this is on my lap just after a feeding, but look, her eyes are open now! Working with raccoons has been a great experience. 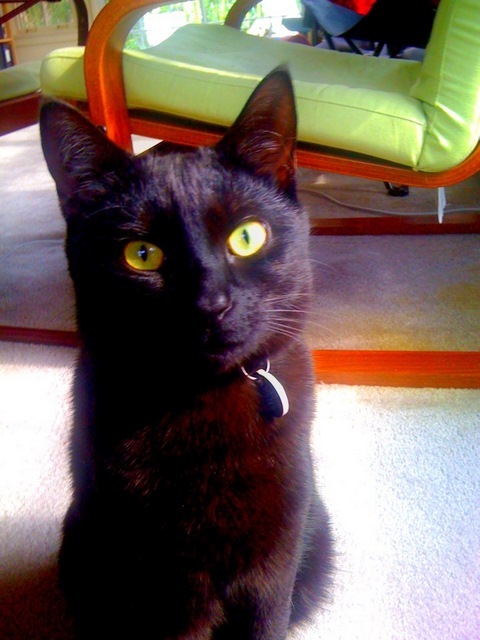 When they are babies, they’re a lot like cats, and are very affectionate and sweet. I’ll keep you posted on Rica and Rowena’s growth over the upcoming months. I feel terrible they aren’t with their mother any more, but they’re in great hands with the rehabilitator and I intend to be the best (part-time) surrogate mother I can be, and in five months when they are old enough to be released, they’ll not only be in a great location, but right next to a county park that has special meaning to me and Mark. So that’s almost as good as their being in my yard, and really, probably safer for them in the long run. We have a LOT of wildlife around here, which I absolutely love, but we DO live in a suburban neighborhood. The park is probably nicer for them. Finally, tomorrow will mark one year from the day we met Gomez and Torticia. I can’t believe it’s been a whole year already, although at the same time I can’t imagine a life without them. We were really, really, really, really lucky: these cats are simply the most wonderful, perfect cats in the world. I can’t tell you how much I love them. As a tribute, I’ll be making a donation to the Northern Virginia SPCA this week in the same amount I paid for them last year (I’d give even more if rabies vaccinations didn’t cost a gazillion dollars, leaving me broke this month…) because I love these cats, I love the SPCA for bringing them into my life, and I want the SPCA to continue to bring other people and cats and dogs together to form bonds like I have with Gomez and Torticia. One last thing: if you haven’t seen it yet: Vegan Black Metal Chef. And if you liked that, Black Metal Library rockers. My day has been filled with an inordinate amount of black metal, which I don’t even like…unless it’s about vegan food or books!